I needed a new lamp for a night stand, nothing fancy, but practical. Most small lamps are in the $20 to $30 dollar range and where either too big or not enough wattage for what we needed. Being use to a traditional lamp with shade we where a bit apprehensive about this Mainstays Spotlight Accent Lamp for the night stand but thought we would give it a chance, it was a great decision!At only about 5.5 inches wide and 7.5 inches tall it takes up very little room. the lamp is able to tilt so having it face straight up gives off more light or we can tilt it at the wall for less light. We put in a 13 watt CFL bulb and it generates no heat to the exterior of the lamp, always cool to the touch. The switch is about 10 inch from the base so it is easy to reach. The lamp itself is very stable and with 3 cats have had no problem with it being knocked over.If your tight on space or money the Mainstays Spotlight Accent Lamp is a good choice. 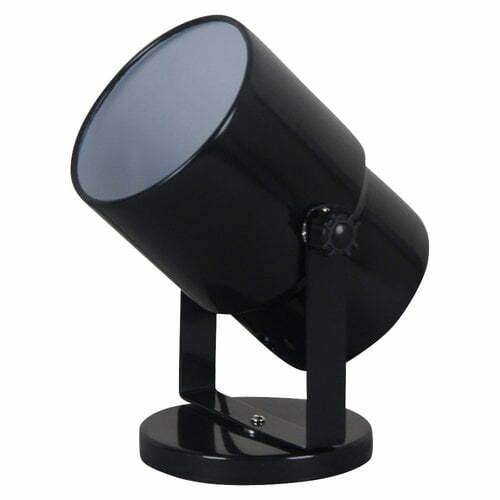 Home territory searches the web to find the best prices and availability on Lamps and related products foir your home like Mainstays 7.5" Spotlight Accent Lamp, Black Finish. For this page, related items include products we find that match the following keywords: "Lamp" at our vendor partner Walmart - Click More Info / Buy Now to check for price rollbacks!. Mainstays 7.5" Spotlight Accent Lamp, Black Finish is one of 34 Lamps and related products available for sale through HomeTerritory.com, If you have any questions on this product, please give us a call at 734-971-1210 during the hours of 9am - 5pm EST for assistance. Thank you for shopping at Home Territory, the home furnishings superstore!